Getting a good start is not always a piece of cake. If you want to be in the front row when the starting signal is made, you often must fight it out in the trenches for two or three minutes beforehand. Your final approach to the start depends on the number of factors including the characteristics of your boat, the wind conditions and the behaviour of other boats around you. 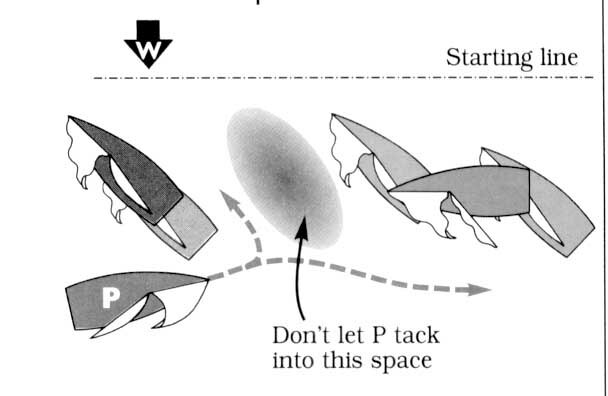 In general, you should tack onto starboard somewhere to the right of the position (Point X) where you have chosen to start based on your strategy. The time at which you set up and the distance from your starting point depend on many things. For example: a) The lighter the wind, the closer you must set up to X; b) The heavier your boat, the farther you must set up from X; and c) The bigger and more aggressive your fleet, the earlier you must set up (to reserve a spot in the front row). When you come off the starting line, which boat would you rather have just to leeward of you - the national champion or the slowest boat in the fleet? You don�t have to be a rocket scientist to figure this out, so don�t just leave it to chance. As you make your final approach on port tack, look for a boat luffing on starboard tack that you know will not be fast upwind. Sail just past her transom and tack onto starboard a boatlength or two to windward of this boat. Maintain your position so this boat is on your leeward side at the start. Once you�ve set yourself up on starboard tack for your final approach to the start, you must create and protect a �hole� on your leeward side. It�s essential to have some space here at the start so you can accelerate to full speed and sail fast without worrying about being pinched off. The amount of space you need at the start is a function of wind and sea condition, boat type and starting line angle. For example, you need more space to leeward in light air and lump than in a breeze and flat water. And you need more when the pin end of the line is favored since the leeward boat will be able to start with her bow farther ahead of you. You need at least half a boat length to leeward in most situations, and more is better. As you approach the start, don�t carve out too much room. If you try to protect more than your share of the line, other boats will fight to get into your space. Defending your hole will be a distraction, and if one of the other boats manages to slide in to leeward of you, your chances of getting a good start will not be very good. Therefore, carve out a small but barely sufficient hole and guard this. Don�t tempt other boats to squeeze in there. Once your competitors have settled into their spots on the line *usually with about 30 seconds to go), work on making your hole a little bigger by sliding up closer to the boat on your windward side. To keep other boats from taking your space, there are several tactical moves you can make. One threat is a boat approaching on port tack. To prevent her from tacking into your spot, bear off and aim at her when she is still a couple boat lengths away. Keep you sails luffing so you don�t move forward too much (which would use up hour hole). The idea is to make it difficult for the other boats to tack safely into your hole. Hopefully, she will continue past you, looking for another spot, or at least tack farther away from you. As soon as she does that, trim your main hard and turn back up toward the wind. Another threat is boats on starboard tack that are coming from astern and to leeward, looking for a hole. Here your defence is roughly the same: Before they get to you, bear off and luff your sails. You want them either to luff up into the space on your windward side, or continue down the line looking for another hole. At the same time, you don�t want to use up your space to leeward - try to stay on the windward side of your hole as much as possible. Once you�re in the right spot with a decent hole to leeward, you must be able to accelerate your boat quickly to full speed. If you aren�t good at doing this, you will either a) take extra space and end up too close to the boat on your lee bow, or b) take too much time and get rolled by the boat to windward. � You have to know how far and how long it takes your boat to accelerate from a near-stop to full speed in the existing conditions. For example, an Optimist might need for seconds and 1.5 boat lengths to reach full speed in 10 knots of wind. In the same conditions, a J/24 might require 20 seconds and four boat lengths. This is important to know during your final approach as you think about where to be and when to �pull the trigger� (i.e. start accelerating). � If there is a mid-line sag and you know where the line is, don�t step on your �accelerator� until you have just enough time to get to the line. Hang back and pretend you will start with everyone else; then trim in and go when it�s too late for anyone to catch you. � When you are luffing your sails to slow down before the start, keep your boat on a closehauled course. This way, you can just trim in your sails and go without turning your rudder. If you luff on a course above close-hauled, you will have to turn the boat (i.e. bear off) before you can accelerate. That takes time and it�s slow. � As you get closer to the starting signal, heel your boat to leeward. Then, when you trim in your sails to accelerate just before the gun, flatten the boat simultaneously for optimal acceleration. � When you are early and have to kill time, consider steering an S course (to maintain your speed) instead of luffing your sails (to slow down). This is especially important in heavier boats, which need a lot of time and space to accelerate again after they get slow.